Hello everyone! I have been searching for the past few weeks for a powerful and viable darkness midrange deck that is able to hold its own in the current meta. I have been experimenting with different rulers and card combinations to find the optimal build. This deck does fall into the category but has a slightly more interesting story of how it came to be. A few weeks ago I decided I wanted to build a more casual deck to play with people that had just gotten into the game and to play at the local card shop. I decided that Pricia would be a fun ruler to play casually. I had always liked Pricia and felt like she was actually a very powerful ruler but unfortunately the support printed for her was very lackluster. Due to how underwhelming the sacred beast support was, I dismissed her as only a ruler to play casually and that, unless there was more support, she was not quite competitive enough. I had seen other Pricia builds that ran mostly wind with the sacred beasts and some pump spells. I thought the builds were decent, but I felt she was inclined to be a midrange deck and those kind of decks needed some form of disruption. Thus I decided to use darkness as my base for the deck, since she allows the sacred beasts to be cast with any color will while on her ruler side. I wanted to be able to give her flying when she flipped but I was not very impressed with Xuan Wu (the blue one), so I decided that I would play blue as a third color for Cheshire and Hera. 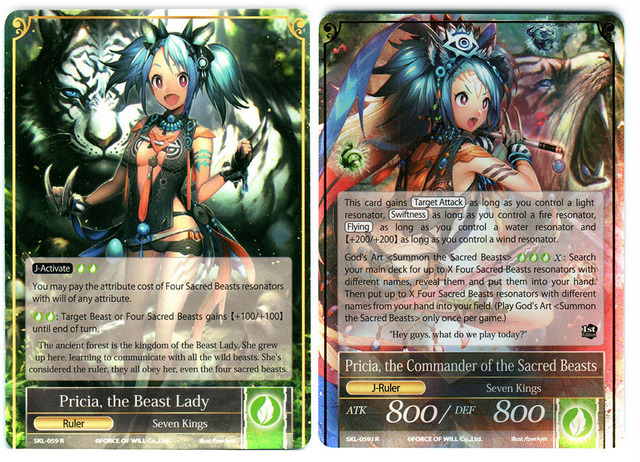 These provided card draw and regalia removal while also giving Pricia flying. One of the best one drops in the game. It provides card draw and filtering and helps make any deck more consistent. It also provides a recurring chump blocker which is very helpful. It is also blue which gives Pricia flying. She is also blue, enabling Pricia to fly. She also destroys opponent’s regalia and draws a card, which is very useful in the current meta. These are the main reason for playing Pricia as the ruler. They each become more powerful as there are more on the field and each provides a fairly relevant ability when they enter. Of the three sacred beasts I played, I was most impressed with Bai Hu. 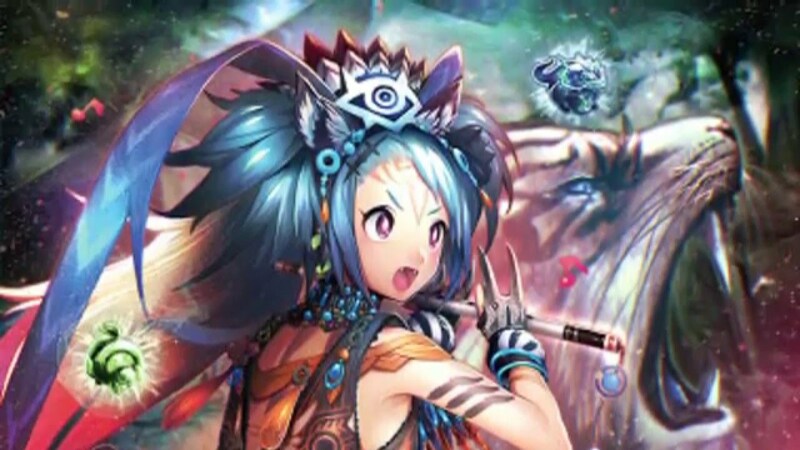 He is a 600/600 target attack for 3 which is alright stat-wise and with Horn can be casted as early as turn 1. His life gain ability was very useful and help cushion the deck against more aggressive decks. Zhu Que was also solid and was happy playing them in the deck. They were able to kill smaller resonators and with more sacred beasts on the field they could even kill larger threats like Lancelot. Qing Long was the least impressive by himself but with any other sacred beast he was a huge help. His pump was very relevant, enabling the deck to be more aggressive, and also enabled Bai Hu to kill larger resonators. I like this card. It provides the deck with more removal as well as another source of life gain. The pump ability does not really help this deck very much but I felt she provided enough value for the deck without taking much advantage of it. One of the most powerful ways to disrupt your opponent is to force them to discard cards. It reduces the options they have to play around our threats and slows their game plan down significantly. These cards were essential and provided a huge amount of power for the deck. This card provides more cheap removal and kills many relevant resonators that are being played. Still one of the best removal spells in the game. It kills anything at instant speed. Very good will play 4 of them in any darkness deck. I’m not sure how I feel about this card in the deck. It can be a blowout when you have several resonators on the field and can kill out of nowhere. On the other hand it does nothing when you are behind. I’m thinking this is the most likely card to be cut as it feels like a “win more” type of card. I was very impressed with this card. It allowed the deck to do more each turn. The horn helped mitigate the higher mana cost for the sacred beasts and allowed them to be cast one or more turns earlier than they should be. They also freed up stoned to be used for removal or discard spells while also progressing your board state. They give Pricia a power boost and imperishable for free which was incredibly helpful. After playing the deck against more casual decks, I found it to win a significant amount on the time. I then began testing it against other drafts of competitive decks my play group were working on and it was able to hold its own very well. I then began to test the deck against powerful Reflect decks to see just how strong my brew was. Sadly, it just wasn’t able to handle Reflect/Refrain and Change the World. These two cards together are so oppressive and allows the player to play through disruption and still push their game plan. The Pricia deck felt like it could almost win every game but just wasn’t able to beat Reflect with change the world. With the errata to Reflect, the deck may have a better chance to preform or perhaps changing the colors around (playing red provides more removal) could also help the deck. This is a list I will definitely test out more. The deck was an absolute blast to play and has a decent amount of disruption. If you’re looking to play something that will turn heads at your locals I highly suggest trying this one out. Hope you enjoyed this list and keep an eye out for my next brew here on Of Dice and Pens. Is there a ruler you want me to build? Let me know in the comments and I’ll try to brew something up! Andrew is an electrical engineer and an avid card game player with over 14 years of experience in Magic the Gathering. He loves brewing new decks and playing music in his free time. I love little red. I’ll definitely brew something up! Hiya! It’s so great to see a fellow Pricia player! Do you think you can do Pricia splashed with other colors too? Thank you! Hey man, I looked you up on facebook to talk to you about this deck. Looking to find out if you’ve played with it still if so what changes you’ve made etc. Hope to hear back from you!